Last weekend, I won the Grand Prix at MagicFest Prague. I got a few lucky breaks in top 8, but I’m very proud to take the trophy home. Ultimate Masters is an excellent draft format. Sadly, most of you won’t be able to draft it anymore, so I won’t go in depth about the format. Summarized, my advice would be to dream big when drafting this format. Aim for the most unfair things. 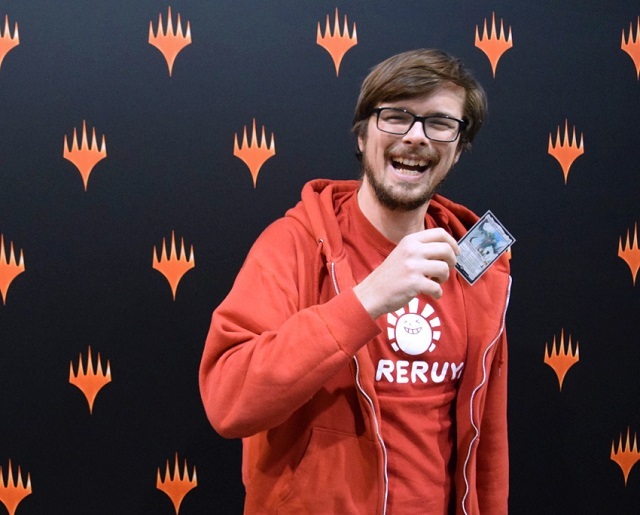 Prague marked the third individual Limited GP in a row I managed to top 8 (Bologna in 2017 and Warsaw in 2018). I might write an article about my preparation for Limited GPs in the future, but for now, I’d like to focus on the new set. As Ravnica Allegiance is right around the corner, I like to look at the spoiler and look which cards might be upgrades to existing decks. 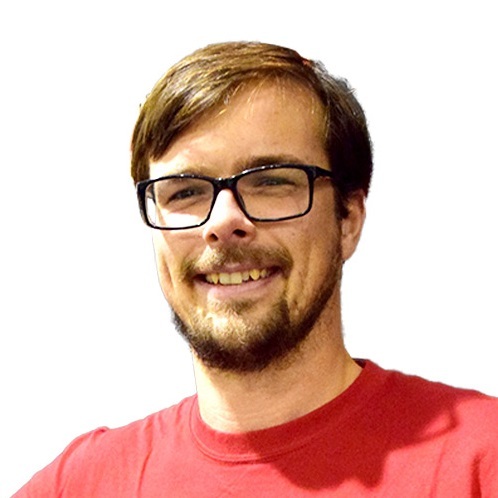 Starting with proven decks is a safe choice when a new set releases, but it’s important to look for cards which might be upgrades for those decks. This deck often splashes red for 《Heroic Reinforcements》 and 《Experimental Frenzy》. 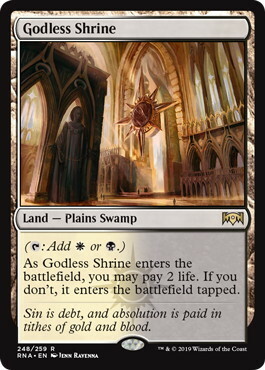 With the addition of 《Hallowed Fountain》 and 《Godless Shrine》 to Standard, splashing other colors is possible as well. 《Hero of Precinct One》 could be a possibility. Curving 《Hero of Precinct One》 into 《Heroic Reinforcements》 sounds strong. Finding enough multicolored cards might be challenging, but the payoff might be just worth it. 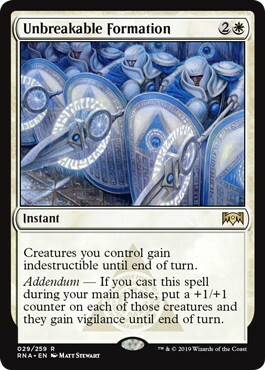 《Unbreakable Formation》 is like a split card between countering a 《Kaya's Wrath》 and a 《Glorious Anthem》 effect. It also makes sure you can flip 《Legion's Landing》 and push damage through, without losing any creatures. 《Deputy of Detention》: if you choose to add blue, you could add some powerful three drops. 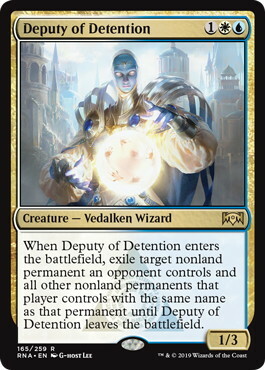 《Deputy of Detention》 is a very nice answer to Token strategies, and can help push through damage. 《Detention Sphere》 saw a lot of play. Adding a body to it isn’t necessarily a bad thing for this deck. 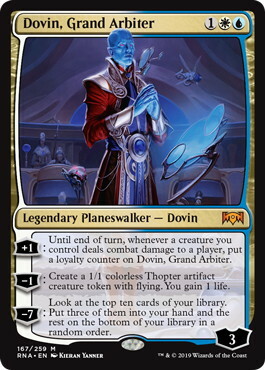 《Dovin, Grand Arbiter》 can have 6 or 7 loyalty on turn 3, which would force your opponent to deal with it fast. The steady stream of flying Tokens isn’t something most decks can just ignore. 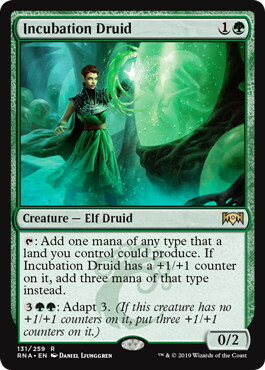 The black-green midrange deck is very adaptable and can be updated to be a dominant force no matter the metagame. Building the correct list varies a lot from week to week, but the deck gained some significant new tools. I wouldn’t splash a third color in this deck for now, even though the addition of 《Blood Crypt》 and 《Stomping Ground》 could give you access to red cards. 《Cry of the Carnarium》 could be an upgrade over 《Golden Demise》, depending on the opposition. It stops 《Hunted Witness》 and the new “Afterlife” cards from making tokens. Exiling a 《Arclight Phoenix》 might also be something you’d be interested in. 《Cry of the Carnarium》 can also exile your own creatures however, which is a potential downside. 《Growth-Chamber Guardian》 also be used as a source of card advantage, while still being able to pressure the opponent. If the “Explore” package would become less useful, 《Growth-Chamber Guardian》 would be a reasonable replacement. 《Incubation Druid》 should be an upgrade over 《Druid of the Cowl》. It helps with the double black casting cost of 《Vraska's Contempt》 and 《Ravenous Chupacabra》. Next to that, it grows into a sizeable body. 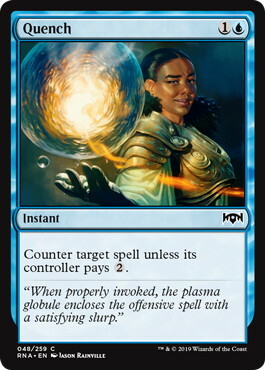 Making three mana at once isn’t something to scoff at either. The easiest and most important upgrade for this deck is 《Hallowed Fountain》. Even though the manabase was decent before, the importance of a perfect manabase cannot be overstated. 《Absorb》 should be a solid upgrade over 《Sinister Sabotage》. Adding lifegain to a counterspell makes up for an inherent weakness counterspells have against aggressive decks. 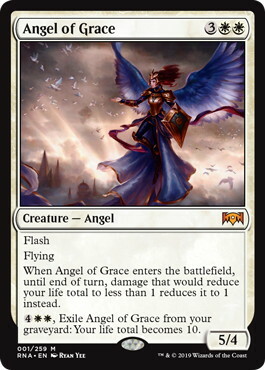 《Angel of Grace》: a threat with Flash could be valuable in control mirrors, while the other two abilities could be very valuable against aggressive decks. 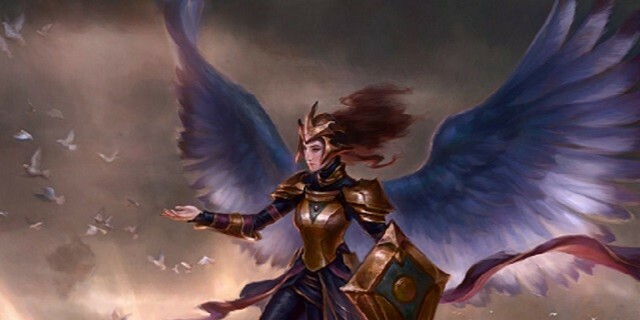 I think 《Angel of Grace》 could do just enough to be a valuable asset to control decks. 《Clear the Mind》 could be a new win condition. I remember the Azorius (UW) Control deck with 《Elixir of Immortality》 as win condition. 《Clear the Mind》 could fulfill a similar role. Let’s hope it doesn’t come to that, for the sake of finishing matches. 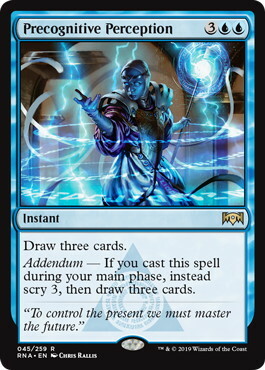 《Precognitive Perception》: 《Jace's Ingenuity》 was played during it’s time in Standard and 《Precognitive Perception》 is a strictly better card. Having the option to dig six cards deep is powerful. I believe control decks might want to play a mix of 《Chemister's Insight》 and 《Precognitive Perception》. 《Quench》: cheap counterspells are always worth noting. With enough card advantage, you should be able to make up for the reduced value 《Quench》 offers in the late game. 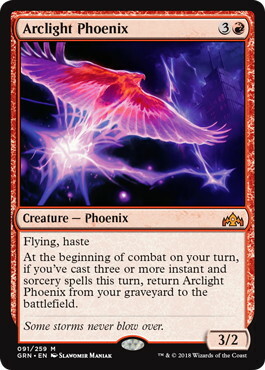 If you have read my previous article, you know I think it’s important to make the distinction between Izzet Phoenix and Izzet Drakes. 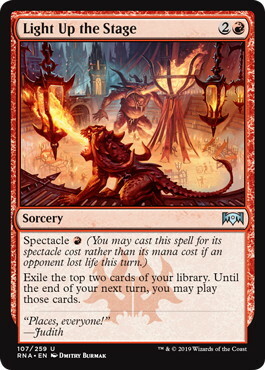 Unfortunately, I don’t see any cards I would immediately want to try in Izzet “Phoenix” in Ravnica Allegiance. 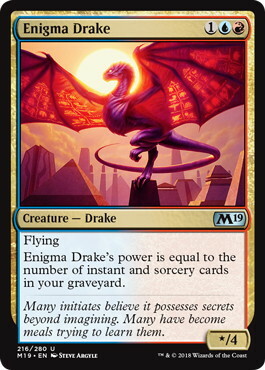 Izzet Drakes could easily splash any color if it’s necessary. Depending on which decks become more popular, this might be needed. 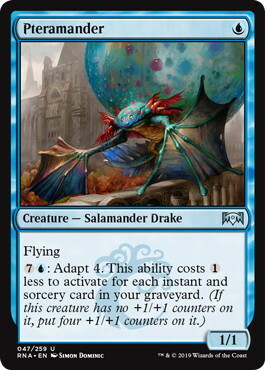 As for now, I see one card Izzet Drakes might really be interested in: 《Pteramander》. In a deck already interested in filling it’s graveyard with instant and sorceries as soon as possible, 《Pteramander》 is force to be reckoned with. It’s also a Drake, so it’s easy for deck naming conventions. 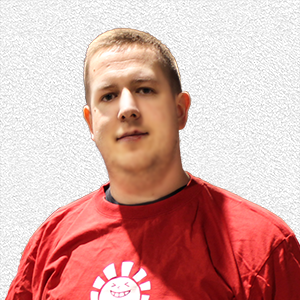 Selesnya Tokens became more popular as the season progressed. 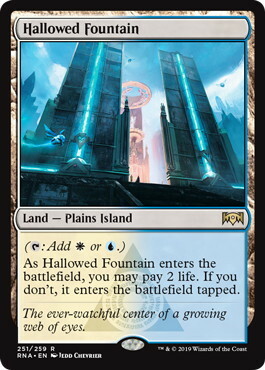 The deck is both capable of a pressuring the opponent early and having a winning combination of 《March of the Multitudes》 and 《Flourish》 in the late game. 《Hero of Precinct One》 would be easier to incorporate in Selesnya Tokens, as the deck already plays multiple multicolored spells. Curving 《Legion's Landing》 into 《Hero of Precinct One》 into 《Flower》, 《Emmara, Soul of the Accord》 and 《Venerated Loxodon》 sounds both unbeatable and not too farfetched. 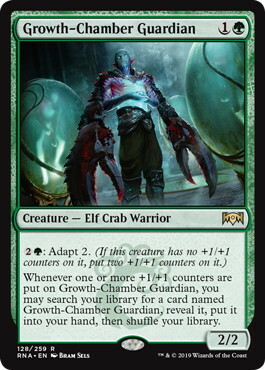 《Growth-Chamber Guardian》 could also be a valuable two drop. 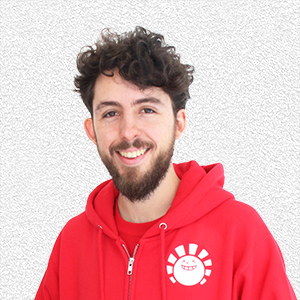 In combination with 《Venerated Loxodon》, you’ll get to search an additional copy as well. 《Growth-Chamber Guardian》 also provides a lot of value on its own, which might give the deck some needed staying power against board wipes. I’ll try to focus on the more aggressive burn version, as I see a lot of new tools for this deck. 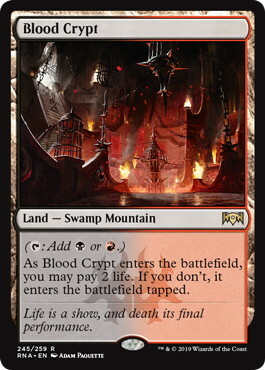 《Blood Crypt》 makes a possible black splash possible. Given the available cards, I believe this might be the direction this deck will take. 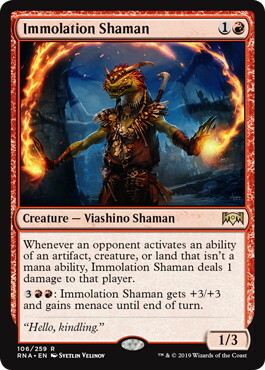 《Immolation Shaman》 could be a role player. It’s more likely this is Ravnica Allegiance’s version of 《Harsh Mentor》, but it’s still worth mentioning. 《Light Up the Stage》: Unlike previous versions of this effect, 《Light Up the Stage》 lets you play the cards until the end of your next turn. In a deck where damaging your opponent early and often is the plan, effectively drawing two cards for one mana seems very doable. Next to that, 《Light Up the Stage》 works well with both 《The Flame of Keld》 and 《Experimental Frenzy》. 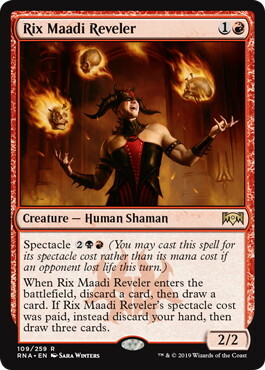 《Rix Maadi Reveler》 is a solid two drop, with major upside in the late game. 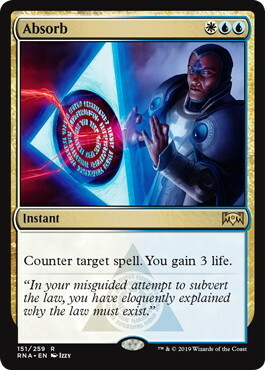 It should be noted that 《Rix Maadi Reveler》‘s trigger is also different than previous similar iterations. The discard is mandatory, but if your hand is empty, you will still draw a card. 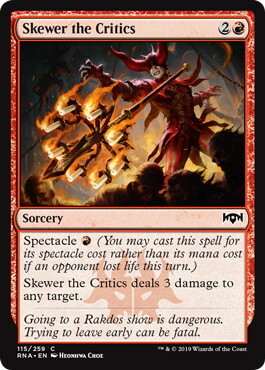 《Skewer the Critics》 feels like a mix of 《Rift Bolt》 and 《Wizard's Lightning》. 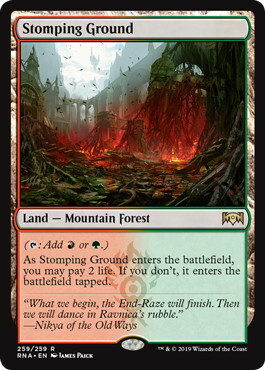 But in the end, it mostly deals three damage for one red mana. 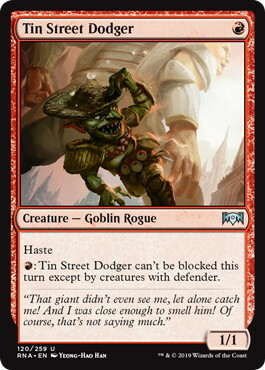 《Tin Street Dodger》 gives you an additional one drop. The little Goblin may not seem like much, but I think it will find its way into a very aggressive red deck. 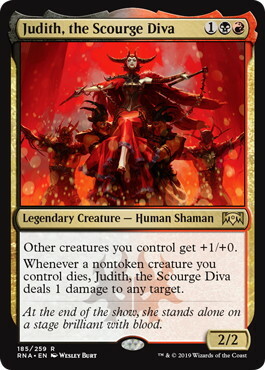 《Judith, the Scourge Diva》 has a lot going for it. It pumps all your creatures and provides additional damage when they die. As a second copy of 《Judith》 is essentially a 《Forked Bolt》, I can see a full playset of 《Judith》 being played. 《Theater of Horrors》 feels like an upgraded 《Vance's Blasting Cannons》. The fact that you don’t have to play the card you exile immediately, is a serious upgrade. The activated ability of 《Theater of Horrors》 shouldn’t be underestimated either. Being able to deal the last couple of damage without casting spells is some nice upside. 《Theater of Horrors》 also plays well with 《The Flame of Keld》. I think many of the existing decks will be upgraded with the addition of Ravnica Allegiance. If you want to try your new Gruul Midrange, Rakdos Aggro or Esper Control deck, I advise you to try it versus the proven decks. But don’t hesitate to upgrade those decks as well. A couple of different cards can completely change how a matchup plays out. As always, hit me up on Twitter @VierenPascal with any questions you may have.